Can you help us to identify any of the people in this photograph? This is a black and white photograph of the college faculty. The man in the front row is Rev. Dr. C.R. Carscallen, principal from 1928 to 1948. To his left is the Dean, Miss A.A. Maxwell. 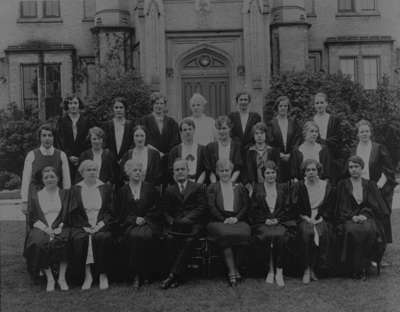 Ontario Ladies' College Faculty, 1932, Panoramic Photography Company. Whitby Archives 23-000-264.